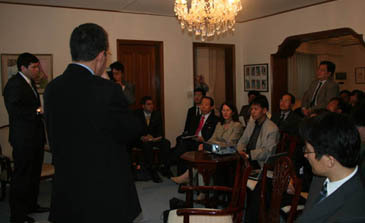 Tunisian Ambassador to Seoul Moncef Baati starts the seminar at his residency in Seoul on April 28, 2006. 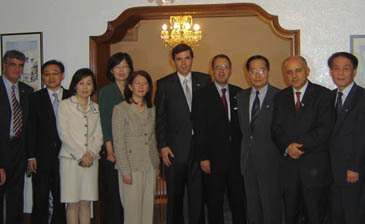 Tunisian Ambassador to Seoul Moncef Baati hosted a seminar and reception for the secretary of state of the Tunisian Ministry of Development and International Cooperation, Khelil Lajimi at his residence in Dongbinggo-dong, Yongsan-gu, Seoull April 28, 2006. Mr. Lajimi is in charge of international coordination and external investment. 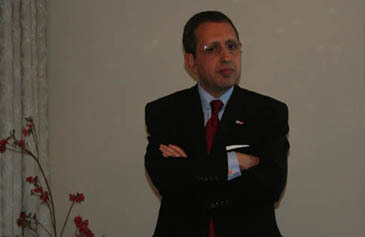 Prior to the reception, the top Tunisian envoy held a seminar for Minister Lajimi. The press conference was joined by a number of friends of Tunisia including business, academic, and media circles in South Korea. In particular, several Korean businessmen and representatives of such Korean economic organizations as KITA (Korea International Trade Association), KOIMA (Korea Importers Association), and UNIDO (United Nations Industrial Development Organization) took part in the press conference. Mr. Khelil Lajimi, the secretary of state of the Tunisian Ministry of Development and International Cooperation in Seoul. on Tunisia and its economic development as well as its business and investment environment. Mr. Lajimi noted that Tunisia's macroeconomic indicators continue to be impressive despite the difficult international economic juncture, particularly the increasing prices of raw materials and oil. He said that during the last decade Tunisia has maintained a steadily growth of 5 percent, while controlling inflation and unemployment. Tunisia's exports are the main driving force for growth for the Tunisian economy. They represent 44 percent of GDP with an average growth rate of 6 percent during the last five years. Exports of manufacturing goods have increased at a fast pace, currently accounting 80 percent of the total exports volume. Mr. Lajimi also touched upon Tunisia's endeavors to modernize its economy and attracting foreign investment, stressing the development of its infrastructure and human resources. Tunisian Ambassador to Seoul Moncef Baati (4th from right) poses with Tunisian Secretary of State Khelil Lajimi (5th from right), Chairman Yun Ik-Han (3rd from right) of The Seoul Times, and other guests at the seminar at Tunisian Embassy in Seoul. 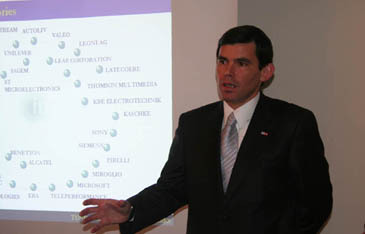 He pinpointed the government's effort towards the liberalization of the economy, indicating that most of the state-run companies were either privatized or under privatization process. The government is currently offering for sale several hotels and construction companies. — The convention signed and ratified between the Tunisian and South Korean governments since September 1988 regarding the "avoidance of double taxation and the prevention of fiscal evasion with respect to taxes on income." 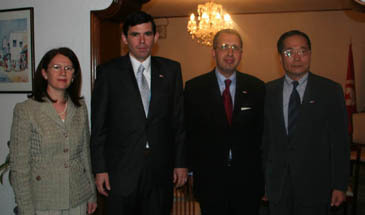 Tunisian Ambassador to Seoul Moncef Baati Tunisian (2nd from right) poses with Secretary of State Khelil Lajimi (2nd from left), Chairman Yun Ik-Han (right) of The Seoul Times. At left is Mrs. ambassador. With a very low risk level, Tunisia's investment ratings by the international institutions and financial agencies is in constant improvement, according to Mr. Lajimi, who added that his country is ranked first in Africa and in the region regarding economic competitiveness. Tunisia's rating according to the World Economic Forum in Davos was even before all Latin American countries and some Eastern European countries in terms of competitiveness. The secretary of state emphasized Tunisia's geographic proximity to major markets including Europe, the Middle East, and Africa. He added that the Association Agreement and FTA Tunisia concluded with several countries including the EU, the Arab and African markets, constitute all together a favorable environment for any investor whishing to expand his business and exports in the region. During his presentation Mr. Lajimi focused on opportunities for South Korean investors in Tunisia, giving an overview of the major promising sectors for foreign investment. 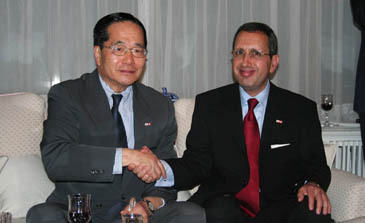 Tunisian Ambassador to Seoul Moncef Baati (right) shakes hands with Chairman Yun Ik-Han of The Seoul Times at his residence. Mr. Lajimi said there are thousands of foreign corporations currently operating in Tunisia. There are also several South Korean companies including Samsung and LG, but there is no South Korean manufacturing corporation in Tunisia. In Tunisia, South Korean companies are involved in only trading so far, Mr. Lajimi pointed out. Mr. Lajimi said that he was impressed by economically dynamic South Korea. He said that he and his delegation visited the industrial city of Ulsan in South Gyeongsang Province, which was very impressive to him. Mr. Lajimi praised such South Korean companies as Hyundai Heavy Industries Co., Hyundai Motor Company, and Samsung Electronics Co. among South Korean economic giants. He introduced Tunisia as No. 1 IT power in Africa, stressing investment opportunities for South Korean companies. He underlined the encouraging environment for ICT investment in Tunisia, adding that the leading role of S. Korea in this sector coupled with the emerging role of Tunisian operators in ICT, especially in the software industry, constitute strong assets for a fruitful cooperation between both countries. He added that S. Korean operators are welcomed to invest in this sector, inviting them to join Tunisian technological parks such as "the Tunis telecommunications park of "al Gazala" which is ranked 46th in the world. Its very modern infrastructure meets the needs of international companies working in the advanced sector of new information technologies. 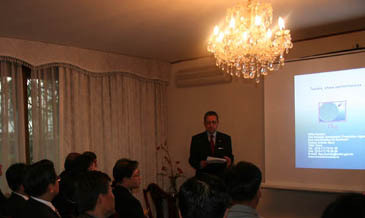 Tunisian Ambassador to Seoul Moncef Baati leads the seminar. Mr. Lajimi's presentation was assisted by Mr. Nourdine Zekri, director general of Foreign Investment at the Ministry of Development and International Cooperation. Mr. Lajimi's visit to South Korea was at the invitation of the Import Export Bank of Korea, which, in cooperation with the African Development bank (ADB), organized a seminar on ways to strengthening cooperation between South Korea and Africa. During his visit , Mr. Lajimi paid a courtesy call on South Korean President Roh Moo-Hyun. He also met with local leaders including business tycoons. The seminar was participated by many locals and foreigners from business, academic, and media circles. Among them were Chairman Yun Ik-Han of The Seoul Times, and Prof. Behzad Shahandeh of Hankuk University of Foreign Studies (HUFS). Prof. Shahandeh, who is Iranian, teaches Arabic at HUFS' Graduate School of International Area Studies. Among the businesspeople was President Park Mi-Ra of KOSCO, a Bundang-based manufacturer. 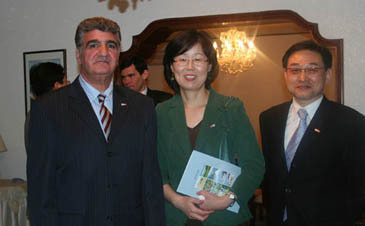 Prof. Behzad Shahandeh (left) of Hankuk University of Foreign Studies poses with other participants at Tunisian Embassy. Other participants are Mr. HanYang-Sup, president K-LUX Co; Mr. Kim Dae-Bok, vice president of Korea Electric Power Data Network (KDN); Mr. Kim Kang-Hee, president Servo Tech; Mr. Woo Ho, CEO of KOINA Corporation; Mr. Lee Jung-Wook, executive director of Pumyang Co. ; Dr. Jung Hae-Jung, president of MK International and director general of Korea Africa Association; Mr. Kang Wan-Gil, UNIDO's head of investment & technology promotion; and Mr. Pedro Hwang of KITA's international cooperation team. The seminar was followed by a buffet during which a traditional Tunisian cuisine was served. The above photos were taken by Susan Song, staff reporter of The Seoul Times. "Korea-Africa Forum Is Turning Point for Ties"